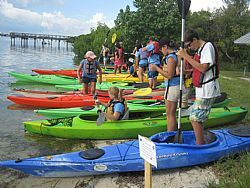 There are eight free kayak tours available with the Sarasota Bay Estuary Program (SBEP) through April. Scheduled trips are planned for Leffis and Jewfish Key (1/7 and 1/21), Lido Mangrove Tunnels (2/4 and 2/18), Blind Pass (3/3 and 3/17), and Lyons and Blackburn Bay (4/7 and 4/21). Two prior excursions to Neal Preserve took place in December. Additional information and registration is available online at sarasotabay.org. Participants are required to bring their own kayak. Please note that while outfitters throughout the region rent kayaks and offer demonstrations and beginner classes, the Bay Wise Kayak Program is for experienced kayakers. The SBEP Bay Wise Kayak Tour Program is a fun learning opportunity to discover the plants, animals, habitats, and restoration projects that distinguish Sarasota Bay. Brad Tanner, an expert kayaker and the School Programs Coordinator for Mote Marine Laboratory is the tour guide for SBEP’s annual program.